Silverstack XT and Silverstack Lab come with HD-SDI output to play out ingested clips in best quality for QC on an HD-SDI broadcast monitor. The current clip in the player gets mirrored to the HD-SDI output showing the image in full-screen and 10 bit color depth. Attach the according interface to your Mac (Thunderbolt or PCIe) and connect the HD-SDI output of the device to the selected destination. In order to use the supported devices you have to install all drivers and necessary software provided by the the manufacturer. 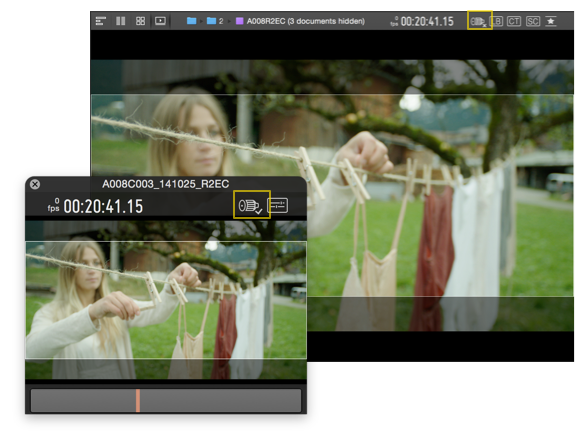 For Blackmagic Design devices that is the “Desktop Video” software you can download in their support area. For AJA Devices that are the “AJA hardware drivers” included in the latest “AJA software installers” also available in their support area. Frame rate supported / resolution not supported: Silverstack will keep the frame rate. The resolution will fall back to a 1920 x 1080 (HD). Frame rate not supported / resolution supported: Silverstack will fall back to 1080p25. Fixed : This setting will let you choose the output format manually. Additionally you can choose to release the device when Silverstack XT is in background by enabling the checkbox “Release device when Silverstack is in background”. By default it will be kept even if Silverstack XT is in background. Please be aware that the support of SDI formats depends on the compatibility of the attached hardware device that the implementation in Silverstack bases on. Figure 3: The HD-SDI indicator will show up in the toolbar of the media player and the Miniplayer. Figure 4: HD-SDI Indicator showing a working HD-SDI output. Click on the indicator to reach the External video out settings with the settings for the HD-SDI output. Click on the indicator to reach the External video preferences to set up your attached device. Click on the indicator to see details about the problem. A usual case causing this status of the indicator would be another application that tries to use the same HD-SDI device as Silverstack XT. Deactivate the background use in the preferences of the application trying to use the same devices as Silverstack XT to avoid the problem. Absolute Time Playback: Tries to play back footage in sync with audio. 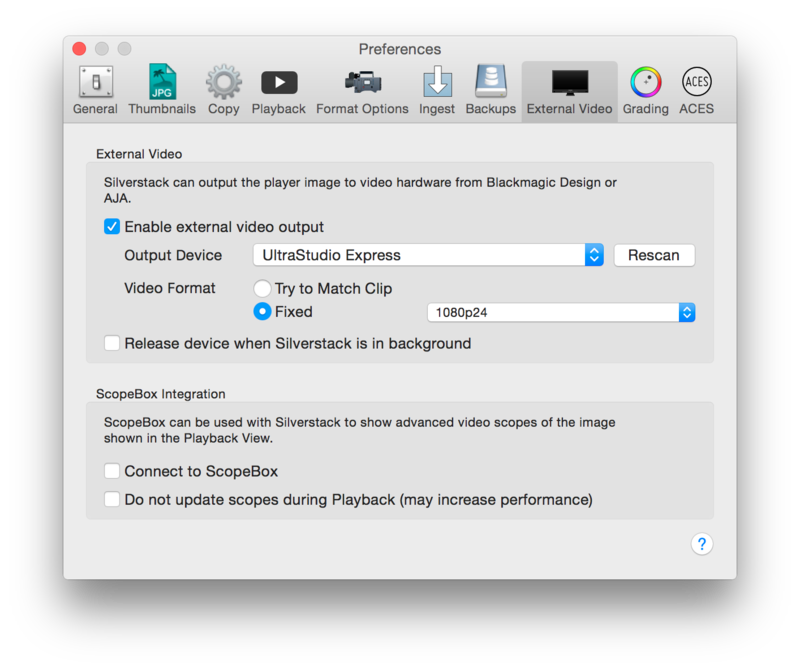 Silverstack XT will skip frames to stay in sync with audio when video processing or I/O is too slow. Every Frame Playback: Aims to play back frame exact which leads to loosing audio. Silverstack XT will play back frame exact even if that leads to non-realtime playback. There are different options when it comes to display the clips through the SDI device. You can modify these settings on the External Video Out window. 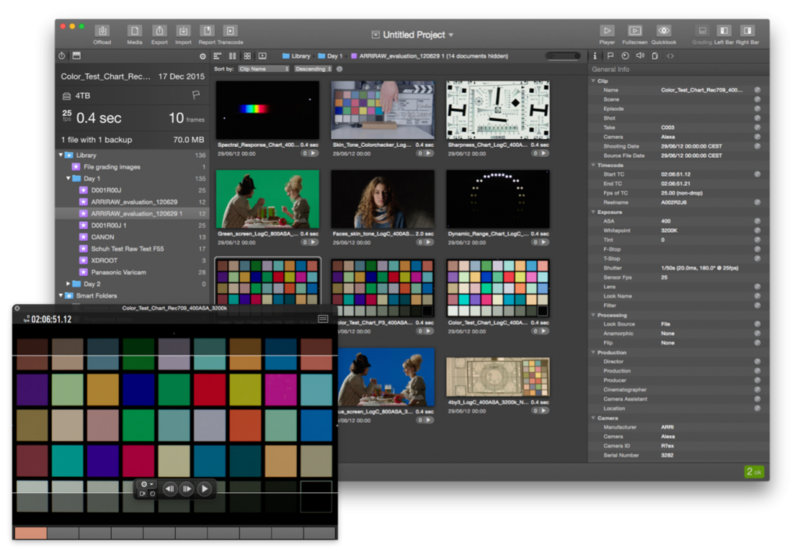 Visual Controls: enable/disable the «Image Analyses» like False Color and Exposure Range, as well as Framelines. 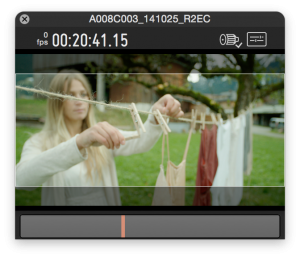 Learn more about frame lines from the article Frame Lines in the Playback View. 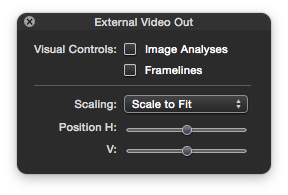 Scale to fit: fills the output display with the image to compensate for a difference in the resolution. 1:1 Pixels: displays the image in full resolution, which can crop the image id the output display has less resolution than the source. Silverstack XT has a fallback resolution (1920 x 1080 HD) and frame rate (25p) that is executed when the desired resolution and frame rate is not supported by your hardware device. That means if either frame rate or resolution is not a native SDI format the SDI output will fall back to 1080p25. Interlaced formats are currently not supported. Additionally, you can enable the Miniplayer from the same menu, which enables to monitor the same image sent through the SDI output on the computer display, at the same time as you navigate across the Project Library. When the HD-SDI Output is enabled it will automatically open the Miniplayer to keep the HD-SDI output though you switched to the list or table view etc. As soon as you close the Miniplayer the HD-SDI output will be disabled. You can reopen the Miniplayer manually from the Main Menu. 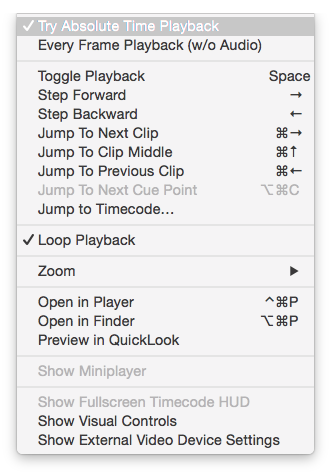 Go to “Playback > Show Miniplayer” to open it up again. You can also open it from the Miniplayer symbol in the header bar on the right.